In 2017, hydropower created more than 4 times clean electricity than solar. It consistently ranks as one of the cheapest and cleanest forms of energy. According to the Department of Energy, America holds the technical potential to double the size of its hydropower fleet. More hydropower can be generated from small, environmentally-friendly projects and upgrades to existing dams. Yet, our hydropower potential is being held back by a cumbersome regulatory process and an uneven playing field. Only a handful of America’s 80,000 dams are outfitted with power generation equipment. Electrifying the top 100 dams operated by the Army Corps of Engineers could generate electricity for over a million homes and create thousands of jobs. The government spends three times less than the private sector on hydropower refurbishments, replacements, and upgrades. Modernizing the fleet will benefit taxpayers, improve system reliability, and create more clean electricity. Many hold outdated views on hydropower. Decades ago, hydropower meant large dams. Large dams meant taming rivers – and taming rivers was frowned upon because of their impacts on fish and other wildlife. Modern technology and responsible development can alleviate these concerns. is estimated to have 47 MW of power generation capacity. As upgrades have been deferred, the plants are breaking down more frequently. The fleet undergoes “unplanned outages” at twice the acceptable industry standard.6 According to a USACE analysis, neglecting to modernize 54 of its plants would forego $7 billion in electricity sales over the next 20 years.7 New equipment would simultaneously maximize flows to federal coffers and bolster U.S. clean energy generation. The bureaucratic and cumbersome federal funding process is a large part of the problem. USACE relies on Congressionally appropriated funds for non-routine maintenance, a process which can take over a decade. A law passed 15 years ago, the Water Resources Development Act of 2000, allows PMA customers to pay for upgrade projects upfront. Each PMA can finance improvements by levying a fee on its customers that already benefit from their below-market electricity rates. Despite the law, USACE reliability is still steadily declining. Research should be conducted on how Sec. 212 can be better leveraged or reformed to modernize the USACE fleet. Allowing PMAs to charge market rates would also open up new funding without affecting U.S. Treasury funds or the federal debt. This fix, however, may require legislative changes because PMAs are locked into long-term rates with local cooperatives, utilities, and industry. Private financing has also been proposed as a solution: there is “tremendous amount of interest to provide private capital improvements of USACE hydropower facilities”.13 USACE, however, lacks authority to engage in private-sector deals. Complete privatization of the Army Corps fleet is unlikely because the plants and reservoirs serve many non-power needs, such as flood control and water supply, which serve the public interest. Prospective hydropower developers may need to receive independent approval from over a dozen government agencies. The bureaucracy results in slower permit times, redundant requests, and inflated project costs. Environmental studies for building new plants or even relicensing an existing one can be prohibitively inefficient and expensive. In relicensing one California plant, 38 separate studies were needed with some costing more than a million dollars each. Opportunities exist to streamline this process without compromising the environmental permitting process. High permitting costs are a predictable result. In the case of one California plant, relicensing one plant can cost over $50 million dollars and take over 17 years.15In the case of a Maryland company, regulatory compliance comprise more than 25% of the total project cost.16 In an ‘accelerated’ schedule, it still takes about 10 years to complete a hydropower project. 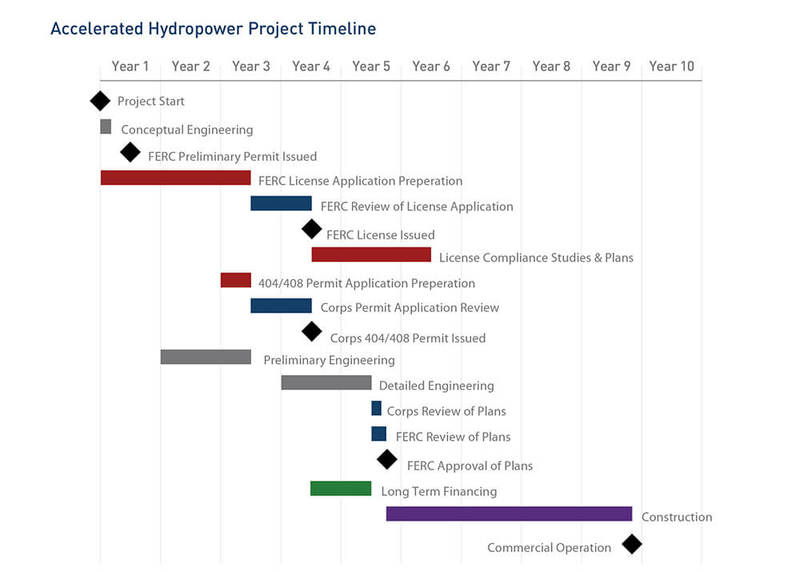 Example of an accelerated development schedule for a hydropower project licensed under the Federal Energy Regulatory Commission. Navigating through the bureaucratic alphabet soup should not be so costly for America’s largest renewable power industry. Currently, little coordination exists between agencies and sometimes within the same agency. The lack of communication often results in redundant information requests from different government agencies. The environmental permitting process must be reformed. The process often has many duplicative requirements that has minimal environmental benefits and increases permitting times. A number of reforms could be made. Resources should be made publicly available to address common questions that arise during hydropower development or relicensing. Developers should be able to apply findings from another study in the area, or submit regional applications where appropriate. Projects that have no environmental impact, such as electrifying municipal water systems, should also be exempted from the federal permitting process. Existing hydropower is not considered a renewable resource for the purposes of federal purchasing requirements. Hydropower should classify as a renewable resource because it is clean, domestic, and natural. Technology-inclusive policies that assist nascent technologies demonstrate commercial performance would facilitate the next generation of clean technologies in the traditionally risk-averse utility marketplace. The United States lacks a national energy policy and it is reflected in our tax code. Each technology has its own set of incentives: oil receives credits to offset drilling costs, wind receives tax credits for each unit of energy produced, and solar receives credits to offset construction costs. As of January 2017, there were 44 different energy tax incentives. 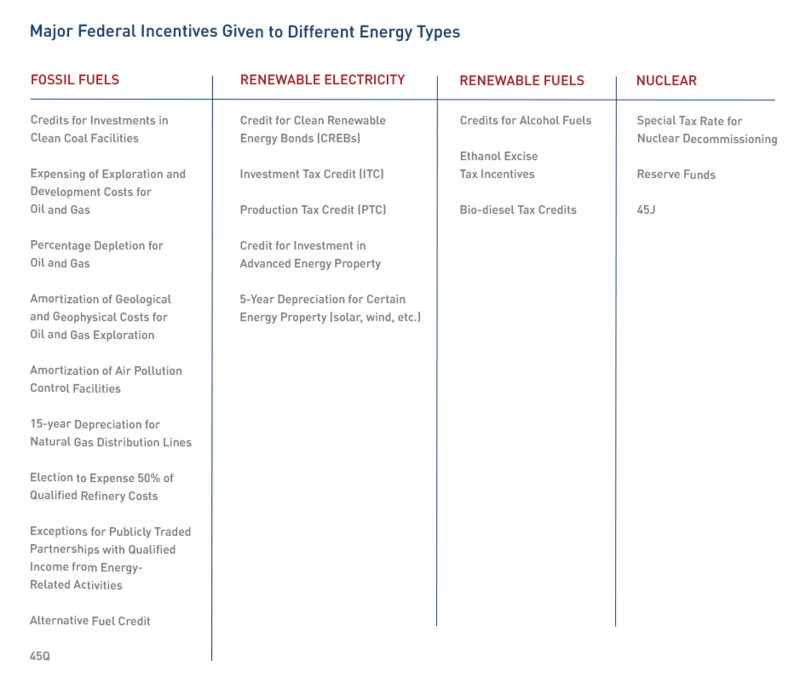 The list of major federal incentives given to different energy types. The federal government is required to purchase 7.5% of its energy from renewable sources, pursuant to the Energy Policy Act of 2005. Existing hydropower, however, is not recognized as renewable under the purchasing requirement.22 Allowing existing, underutilized hydropower capacity to qualify could reduce federal spending while preserving the government’s commitment to clean energy. Renewable energy technologies qualify for one of two main federal incentives: the PTC and the ITC. The federal Investment Tax Credit (ITC) is based on the value of property investment, whereas the Production Tax Credit (PTC) is based on each unit of electricity produced. There’s even different levels of incentives within each tax credit. By creating differentiated tax credits, the government is distorting markets. This patchwork system of credits is confusing and distorts markets. The levels and lengths of incentives have little correlation to technology maturity or market share. The hydropower PTC expired at the end of 2016.